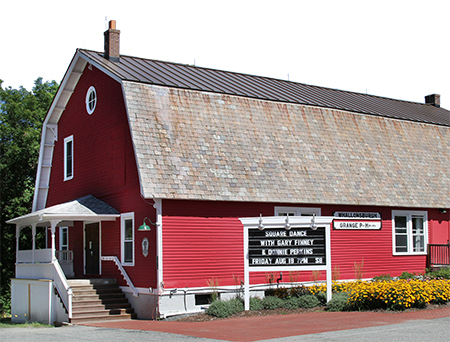 The Grange Hall concerts, movies, plays, and lectures are produced and staffed entirely by volunteers who set up the chairs, sell tickets, make refreshments, run the sound and projection, and other important tasks. Volunteering is a modest commitment for the maximum reward of helping to present terrific programs. Plus volunteers attend events for free. Join us! We have special work days, community dinners, and other volunteer opportunities. All kinds of talents, time, skills, and labor are needed to make this arts and community center grow. The Grange is also certified as an Emergency Shelter by the Red Cross. A small group of volunteers oversees the Shelter and makes sure the Grange is ready in case of an emergency in the community such as a sustained power outage or flooding – anything that might force residents from their homes or create the need for a comfortable, warm place and hot meal. New volunteers are welcome. The Grange is in need of volunteers to join our tech crew as projectionists (DVD equipment) and sound technicians (digital audio). A strong interest and/or background in this type of equipment is helpful, but we will train! The Music and Theater Committee is responsible for bringing local, national and international performers here including Archie Fisher, Rusted Root, Sharon Katz and The Peace Train, Le Vent du Nord, Bread & Puppet Theater, Taylor Haskins Quartet, the Adirondack Shakespeare Company, to name just a few. We also organize and host plays and readings and other special events. The Lyceum Committee puts together our lecture series, with great topics and some of the best speakers around. The Champlain Valley Film Series has been showing current and classic movies at the Grange since 2010, including Captain Phillips (introduced by Captain. Richard Phillips), Where the Rivers Flow North (introduced by author Howard Frank Moser and director Jay Craven), as along with many Academy Award winners such as Spotlight, Argo, and Moonlight and films by local directors such as The 46ers and Ft. Apache. Join us and help pick the movies we show. Other committees include Maintenance and Construction, Fundraising, and Emergency Shelter. We welcome your participation in any of these as well.